The Bell Iroquois Utility Helicopter was designed in 1952 (originally designated HU-1 giving it the "Huey" nickname) to meet the United States Army's need for a utility and medical evacuation helicopter. Existing helicopters were too big, too underpowered, or too complex to maintain easily. In 1963, the UH-1 started seeing use in Vietnam and became a workhorse in that war, extending its use to combat operations with the addition of rocket launchers, grenade launchers, and machine guns. They were commonly called "Frogs" or "Hogs" if they carried rockets, or "Guns" if they had machine guns. They were called "Slicks" if primarily used for troop transport, but even then, they had door gunners. Ultimately, over 7,000 Huey helicopters were deployed in Vietnam and half were destroyed in combat. The Huey had a two-bladed main rotor, with a stabilizing bar at 90° to the rotor attachments, all producing its distinctive whoop-whoop sound. The engine was mounted on top of the fuselage which made servicing easier for maintenance crews. There were large sliding doors on either side of the cabin which were frequently removed in combat, and rescue operations, when quick access was needed. After seeing the need for more protection of troop transports, Bell Helicopter introduced the Attack Helicopter (AH-1) Cobra in 1967. It utilized the same engine, transmission and rotor system of the UH-1 and still remains the backbone of military helicopter fleets in several nations. Over 10% of Vietnam casualties were helicopter crew members, and most of those were the door gunners that protected the helicopter, its crew, and its transports, from their exposed position. The average lifespan of a door gunner on a Huey in Vietnam was just two weeks. RIP, all you courageous young men who answered the nation's call to arms and paid the ultimate price. 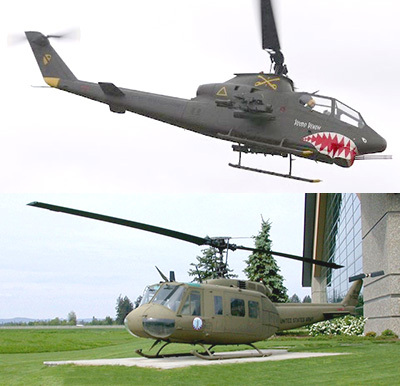 This challenge is to collect photos of life-size UH-1 and AH-1 Huey helicopters. Only helicopters with TWO main rotor blades, in military schemed colors will be allowed for scoring. See below for what won't be scored. D) Enough of the background to identify the location, or photo be geotag enabled. *No parking on sidewalks or lawns, unless given permission by caretakers or law enforcement. 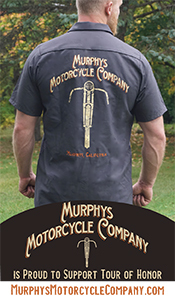 Your motorcycle is NOT required to be in the picture if doing so is impractical or unsafe. An additional photo with rally flag and motorcycle as close to the memorial location as possible when you are unable to get all in same photo. 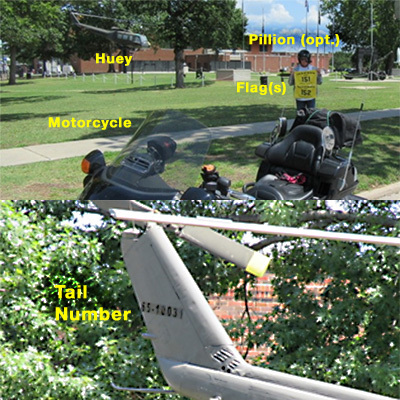 Optional: Multiple Hueys of the same type may be scored at the same location (typically museum settings or military installations) provided serial number photo accompanies each Huey’s photo. Serial number may be found painted on the left hand door post (between cockpit and cabin) and/or the tail. Be aware that not all displays will have a number painted. In this case, alternate markings, i.e. Calvary or Red Cross, may be submitted for consideration. – Helicopters converted for other uses, firefighting, sheriff, government, etc. – Salvaged or boneyard locations (incomplete airframes) will not be scored. – Pictures of museum doors or hangars visited on days or during hours when access isn't available to visit. It is up to riders to pre-scout locations to determine access. – Four main rotor blades. Those with four rotor blades are either AH-1z Zebra helicopters presently used by USMC, or AH-64 Apache helicopters used presently by the US Army. These are NOT eligible for this TOH challenge. Some Hueys may be in the restoration process, but for the purposes of this challenge, it must include the main rotor with two blades, as well as the tail section, attached to the helicopter. Helicopter restored to flying status in military colors as well as trailered displays will be scored provided serial number submitted with photo. These will be scored as a single visit to the helicopter's home base regardless of how many different locations the helicopter might be found. TOH scorers will have final say whether a visit is allowed or not. Locations not yet documented on the Tour’s list are encouraged to be submitted. Include multiple photos (full view, door post, tail number, plaque or any other signage with information) of the find, as well as GPS coordinates or cross street information, and any other pertinent information that may be of interest to researchers. Disclaimer: An asterisk(*) next to the city name indicates the location may be restricted or otherwise requires further inquiry. The asterisk designation is subject to change as information becomes known. Many locations require advance planning and scouting ahead of time. Location may be inside a museum, on a flight deck or on military installation. Some helicopters on the list may be indoors or behind gates, and/or require an admission fee.